Hundreds of U.S. nuclear warheads are kept ready to launch within minutes—making us less safe, not safer. 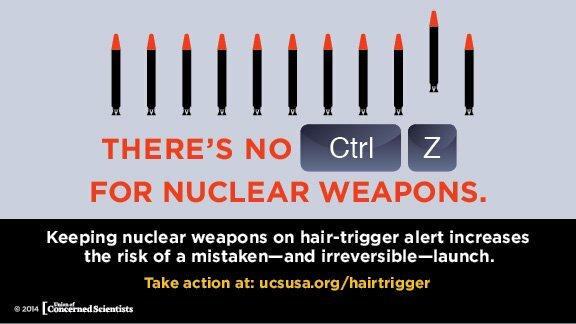 “Hair-trigger alert” is a U.S. military policy that enables the rapid launch of nuclear weapons. Missiles on hair-trigger alert are maintained in a ready-for-launch status, staffed by around-the-clock launch crews, and can be airborne in as few as ten minutes. 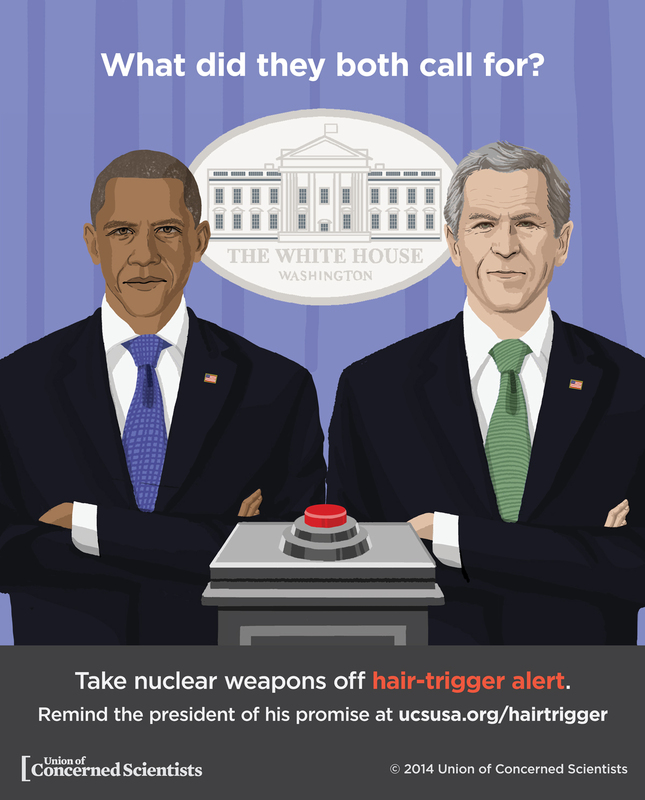 The hair-trigger policy has its roots in the Cold War. Military strategists feared a “bolt from the blue” Soviet first strike, involving hundreds or thousands of nuclear weapons that would compromise our ability to retaliate. By keeping land-based missiles on hair-trigger alert—and nuclear-armed bombers ready to take off—the United States could launch vulnerable weapons before they were hit by incoming Soviet warheads. This helped ensure retaliation, and was seen as a deterrent to a Soviet first strike—a concept known as “mutually-assured destruction,” or MAD. Submarines, which can’t be targeted when at sea, also kept weapons on hair-trigger alert. 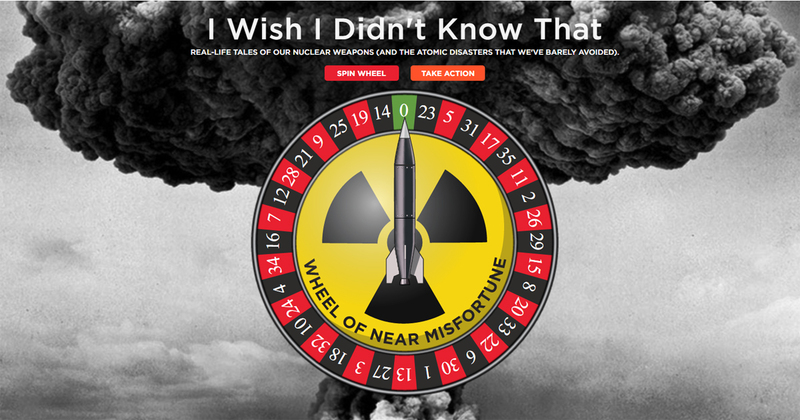 The decision to launch any nuclear weapon was based on information from radars and satellites, and remains so today. The United States no longer keeps its bombers armed and ready to take off. But even though a Russian first-strike is not a credible risk, the United States still keeps its 450 silo-based nuclear weapons, and hundreds of submarine-based weapons, on hair-trigger alert. Thousands more—around 3,500 total—are deployed on other submarines or bombers, or kept in reserve. Why is hair-trigger alert dangerous? 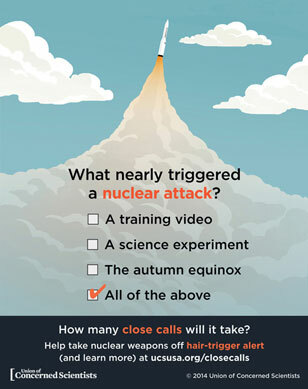 Hair-trigger alert increases the risk of an accidental nuclear missile launch, or a deliberate launch in response to a false warning. The results of such a launch would be catastrophic: modern weapons are many times more powerful than the bombs that destroyed Hiroshima and Nagasaki, capable of killing millions of people with a single warhead. The risks of hair-trigger alert aren’t theoretical. A training tape was once misinterpreted as reality, initiating the steps needed to launch an attack. A defective computer chip once falsely reported an incoming attack at a time of extremely high tensions. And radar and satellite systems have both delivered false positives, giving decision makers limited time to sort out the truth. Removing U.S. land-based missiles from hair-trigger alert would immediately reduce these risks. It would also encourage reciprocity from Russia, increasing our safety further. And because the United States deploys missiles on submarines—which are invulnerable to attack—we would maintain a nuclear deterrent against any first strike. 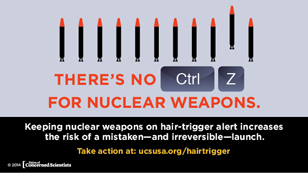 How can we end hair-trigger alert? All US missile silos have a safety switch that is used to prevent a launch of the missile when, for example, maintenance crews are in the silo. The United States could remove its land-based missiles from hair trigger alert by turning this switch to the safe position in each silo. As Commander-in-Chief, President Trump could show real leadership and independently end hair-trigger alert—an act that both Barack Obama and George W. Bush campaigned on, but failed to do once in office.